Volunteers should be able to spare approximately a total of 16 hours during the eight week TechStart program, tentatively scheduled to begin on July 27. Date: Saturday, July 18, 2009 – 9.30 a.m. to 6.00 p.m. Following in the footsteps of such respected media houses as the BBC and the Guardian, PuneTech yesterday played an April Fools’ Day prank on its readers. Click here if you cannot see the video above. It’s different from yesterday’s news clip. We claimed that Pune is expecting growth in revenues in spite of the recession, whereas the other cities, including Bangalore, would see a decline. If you missed all the excitement yesterday, check out our report yesterday. Unfortunately, the entire report was a hoax. There is no company by the name of INHR Associates, the links to the “extended abstract” and the “full (paid) report” are both non-existent, and the the news clip by a “certain TV channel (that will remain unnamed)” was actually created for PuneTech by some of our over-enthusiastic friends. We have shown above a different, more over-the-top version of the same “news video“. It some out-takes and has credits of the cast and crew who made the film. As with the original video, the “reactions” of the average techie-in-the-street are the most hilarious – definitely worth checking out. Needless to say, the video is completely ridiculous. The fact that many people actually believed it to be real, is a very sad commentary on the state of the real news being put out by our TV channels. We have come to expect trash like this from our TV. Check out the ticker at the bottom of the news video. It has ridiculous items like “Mallika Sherawat enters politics” and a bunch of other such things. This was just the first in the long line of people believers. We had a few accomplices (@aparanjape, @d7y, and @amitsomani, and @meetumeetu) who re-tweeted it, after which I believe about 15 to 20 believers retweeted. Oh, the irony! Sorry, @logic, it was #april1. It’s a bit like comparing France with the US. The French don’t have boom-bust cycles like anglo-saxon economies because the French don’t innovate and take risks as much. France is still a lovely place. @Rohit, I doubt that the software/IT/ITES economics of Bangalore and Pune are very different from each other in terms of innovation, risk taking, and boom-bust cycles. I’m sure the explanation for this phenomenon lies elsewhere. Maybe, the Puneites have not realized how serious this thing is going to be. 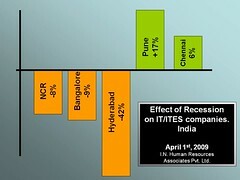 Seriously, the reason might be that Pune has a ton of local industry that the IT/ITES companies are catering to. Bangalore has none. I agree Pune does have other local industry. Also, many other non-IT ‘tech’ companies. After seeing all these reactions, I almost wished that the news item was true. Of course, there were also some believers in the comments on the original post. A few months back when we first got the idea, I casually asked meetu of wogma whether her film-industry friends would be willing to help us out by making a short film for PuneTech as an April Fools’ Prank. She and her friends went nuts with the idea and produced this clip. At that time, I had absolutely no idea of the huge amount of effort that goes into making even a short film like that. But, meetu and her friends, really took to the idea, and worked nights and weekends for almost 20 days to make this clip. I would probably not even have suggested the idea if I knew this beforehand, but anyway, they seem to have enjoyed the process, and we at PuneTech are absolutely thrilled with the final product. We would like to thank them all for the efforts, and for the superb result. 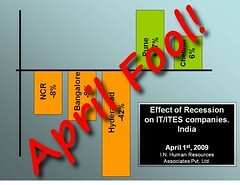 At the very least, I think we should be able to say that Pune handled April Fools’ day much better than Bangalore! 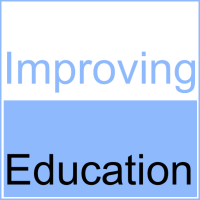 Note: Most of the presentations are online at the conference homepage. 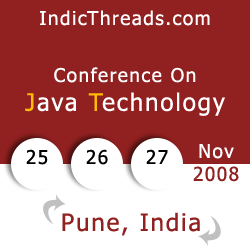 The IndicThreads conference on Java technologies, which is an annual occurrence in Pune happened over the course of 3 days last week, and IndicThreads were gracious enough to invite me to attend the conference (sort of a press pass, so to speak), and although I wasn’t able to attend the whole conference, I did manage to squeeze in a couple of hours each day, and was very glad that I did, because I ended up with some really enriching sessions. Anand also predicted that in the next 6 months, the Industry will see serious job cuts and salary cuts, and he things it is unavoidable. But pointed out that those who take trouble to keep themselves updated in their area of expertise, and go deep (instead of just doing “enough”) will not have a problem, and in fact will be best positioned to take advantage of the situation when the financial situation starts recovering after 6 to 9 months. I missed the rest of day 1, but it has been covered in great detail by Dhananjay Nene. on his blog, as well as Varun Arora on the IndicThreads blog (part 1, part 2). The highlight of day 2, and in fact the highlight of the whole week for me, was the presentation by DJ Patil, Chief Scientist of Linked-in. DJ Patil is in charge of all the data analysis that happens at Linked-in – basically the advanced guess they make like: “people who viewed this profile also viewed these other profiles”, and “people whom you might know” etc. He was not listed on the conference schedule – and was just passing through, and got invited to talk. He gave a great talk on an overview of how linked in works, their strategy for linked-in apps (the third-party apps that are integrated into the linked-in website). Again Dhananjay has already captured most of DJ’s important points on his blog, so I will not repeat those here. But I did have a very detailed conversation with DJ afterwards, and one of the things that came through was that they are looking seriously at India and wondering what they can / should do to get more Indians on linked-in. India already has about 4.8% of linked-in’s users. He was very open about trying to find out what are the things about linked-in that we don’t like, what are the things in linked-in that we would like to change, and what are the features we would like to see. If you have suggestions, send them over to him – he is dpatil on twitter. The third day had a session on Grails by Harshad Oak, and if you are not familiar with Rails, or any of the other “programming by convention” schools of software, it is definitely something you should check out. It can reduce development times by orders of magnitude on things like building web applications and other things that are done over and over by programmers all over the world. For other talks that happened, but which I missed, unfortunately, I haven’t been able to find any reports or blog posts giving details, but you can see the conference schedule to get an idea of what went on.